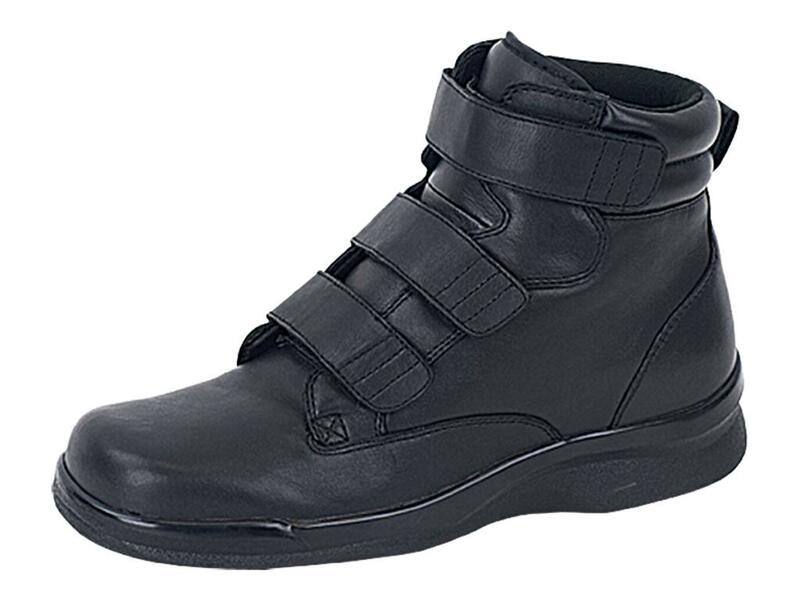 Apex Ambulator Men's Boots - B4200 - Triple Strap Closue - Wide Toe Box - 1/2 inch removable depth Aetrex items ship withing 48 hours or faster and have free return shipping on all exchanges. Top Flight Work Shoe This is by far the best work shoe that I have ever worn. 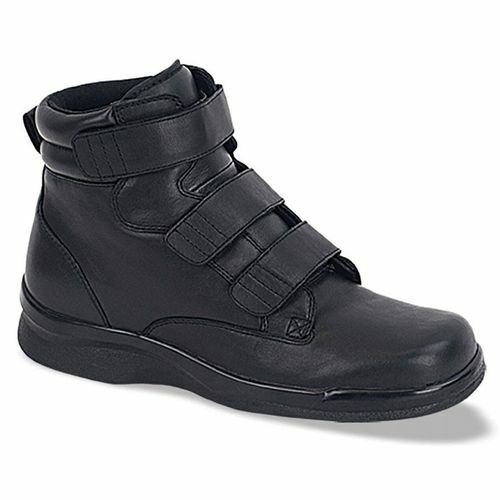 The velcro straps make on and off quick and easy, and the overall fit of the shoe provides total comfort. There are options for making more or less room in the shoe, which can accommodate wearing an extra sock, for example, in the winter. Have worn for well over a year now, and they show practically no signs of wear. Sturdy, tough, but also very flexible without any ankle issues at all. Everything you would want in a work boot. excellent shoe I am an 88 year old disabled Korean War vet----along with those injuries, hip and knee surgeries and my age has added the usual wear & tear on my leg/foot stability---I have worn many different shoes with little difference for my foot/leg comfort---The Apex 3 strap boot has proven to be a great success so far and I expect that to improve as time passes---excellent fit, very comfortable and easy to close up and take off with the Velcro straps---Thanks for a great help in making it much more pleasant to walk and move around! My original reason for picking these boots was because I work in concrete and the strings on my regular boots would snap all the time after being worn and dried out. There were a lot of boots with straps that were girly or they were tanker boots and since I wasn't a tanker I'm not really allowed to wear tanker boots. Advantages: Very comfortable after being broke in. Easy to put on and take off. Surprisingly durable. Disadvantages: It took a week or two for my feet to get used to them. They wore off the back of my heels so much they took off a thick layer of skin. After that there was no problem. I am 6'6", 285 pounds, with high arches, I use supports that I insert into these shoes. These are very nice shoes that seem to be well constructed; and they are supportive. The straps secure them tightly to my feet; it has become easier to fasten them with a little break in. The 15 wide fits me greatly. The tread, although small, works well in snow and ice. I don't know how well the sole would hold up walking a lot on cement sidewalks however, since the treads are shallow. But I won't be doing much of that. I am very pleased with this purchase, and recommend the shoe. Advantages: Easy on and easy to fasten. Great fit true to size or a tad oversized, but great on me. Disadvantages: None apparent as I have only worn then a week or so. I wish this shoe comes in other colors. Advantages: My son is Able to wear this shoe without his prosthetic. Until his new prosthetic comes in he is able to walk in this shoe.